A previous post of mine provided what I hope was a teaser for those contemplating entering the field of amateur astronomy. Starting in 2012, every few months I’ll provide some suggestions on objects that can be easily seen with either your naked eye or low power binoculars that will give you an opportunity to dip your toes into the vast ocean of cosmic knowledge. During the remaining weeks that make up the Northern Hemisphere’s winter, I suggest three prominent objects in the night sky that are directly overhead before you go to bed – Jupiter, Orion Nebula and the Pleiades star cluster. Jupiter, the largest planet in our solar system, orbits our sun between Mars and Saturn and based on Kepler’s Third Law, it takes Jupiter almost 12 Earth years to make one orbit around the Sun. 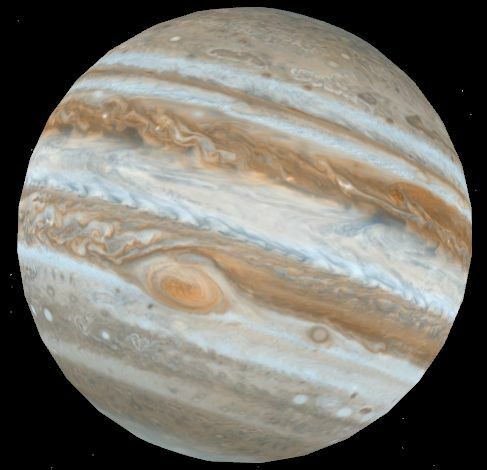 Jupiter is massive and you could fit over 1,300 Earths inside Jupiter but since Jupiter is made of gas, it is only a little over 300 times as massive as Earth. 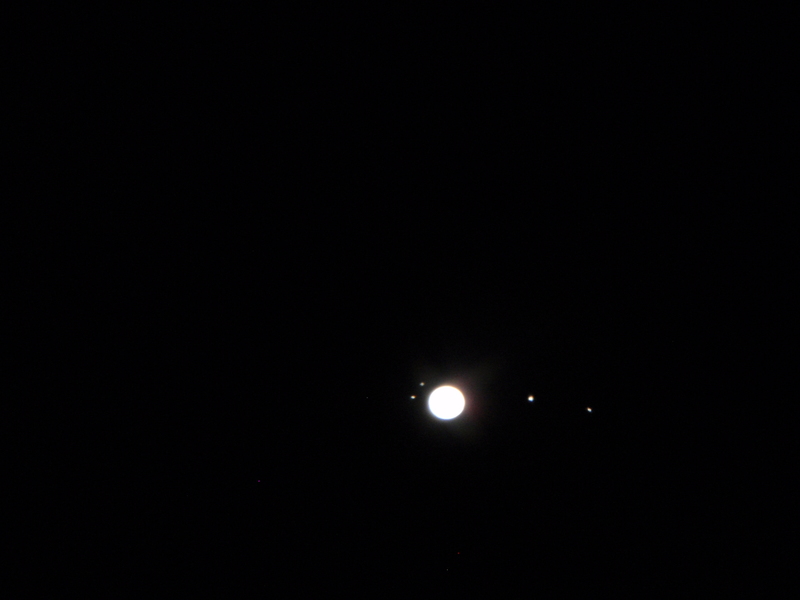 Jupiter has four major moons – Ganymede, Callisto, Io and Europa, which are easily visible with binoculars and with a telescope you can even see the shadows of the moons on Jupiter’s surface. 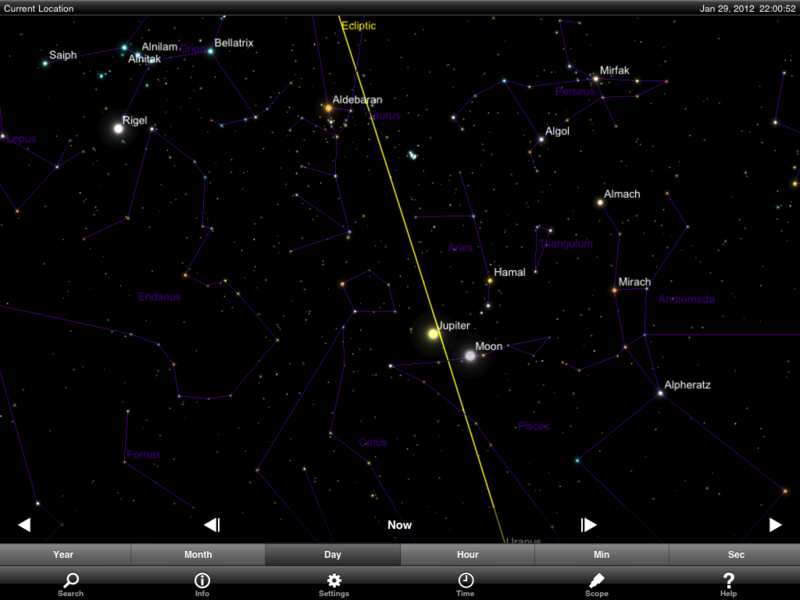 To see Jupiter now, look in the South-West after sunset and it will be the brightest object in that portion of the sky. For those of you who are familiar with the constellations, it is currently in Aries and Jupiter’s location is shown below. 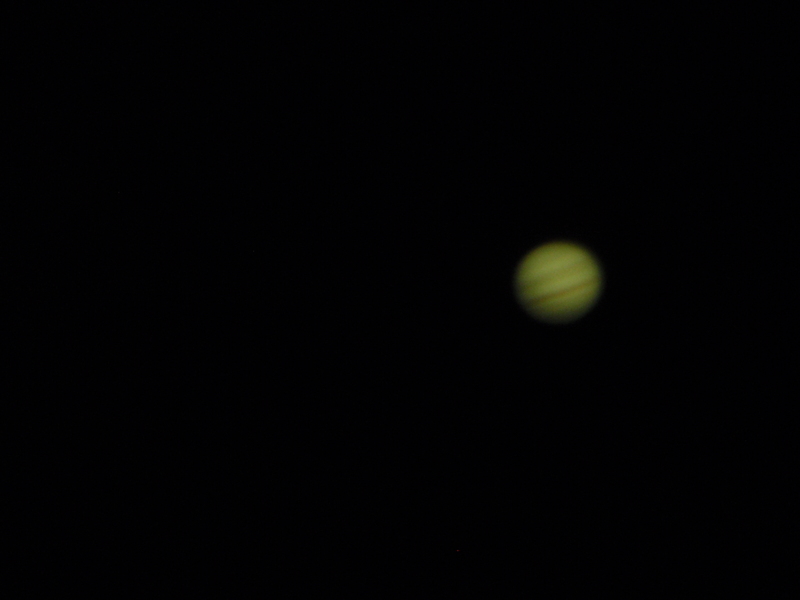 With binoculars, Jupiter will appear as a true orb and not a point of light and depending on the location of the moons, you can see all four of them. 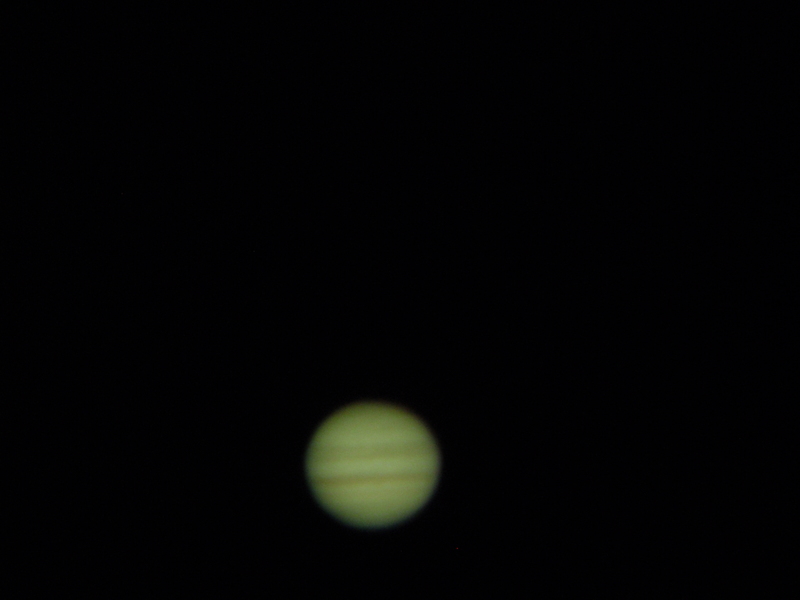 The following images are taken from my telescope but since my scope is a Newtonian on a Dobsonian mount, the telescope doesn’t track the rotation of the earth and they aren’t the best quality. A Nebula is an interstellar collection of gases and if there is enough mass of elements (hydrogen, helium, etc.) then stars are created inside the nebula and this is why nebulae are considered as “star nurseries.” Our star, the Sun, was once born in one of these nebulae and our solar system was born from the combining of elements to form not only our star but our planets. There is a famous nebula that is prominent in the winter sky located 1,600 light years away from Earth in the constellation of Orion the hunter. As a side note – A light year is the distance covered by photons that travel at roughly 300,000 km per second so the Sun is a little over 8 light minutes in distance from Earth. The Milky Way Galaxy is roughly 100,000 light years in diameter and we are roughly 25,000 light years away from the center of the Milky Way so that gives you a reference for how ‘close’ the Orion nebula is to us. The constellation resembles a man hunting with a bow and arrow and he has a belt that has a sword and the stars that make up the sword contain this beautiful nebula. 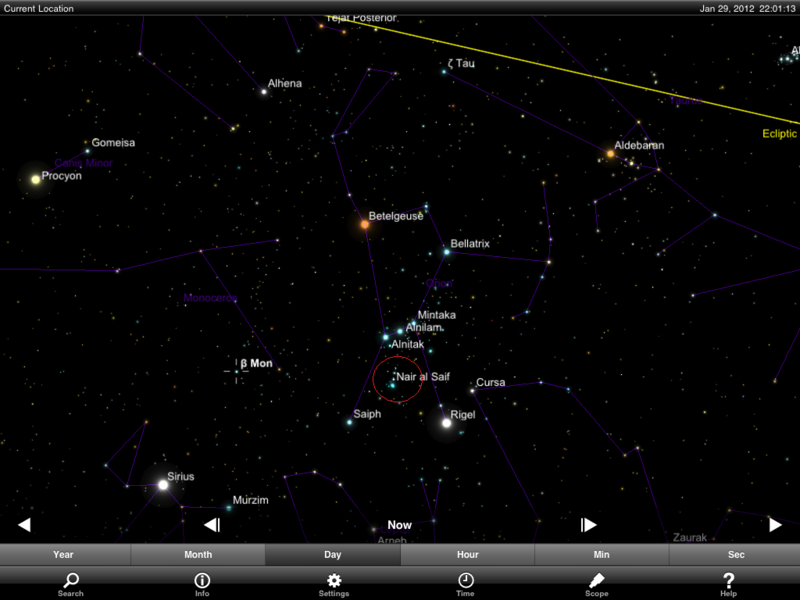 The constellation is located in the South East just after sunset and the location of the Orion nebula is shown in the red circle in the following picture. 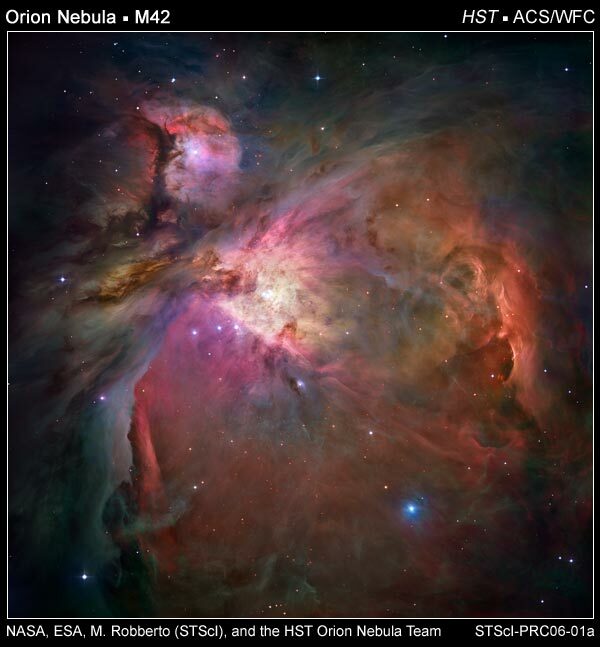 The Orion nebula is beautiful in high powered telescopes and the image pasted above was from the Hubble Space Telescope. 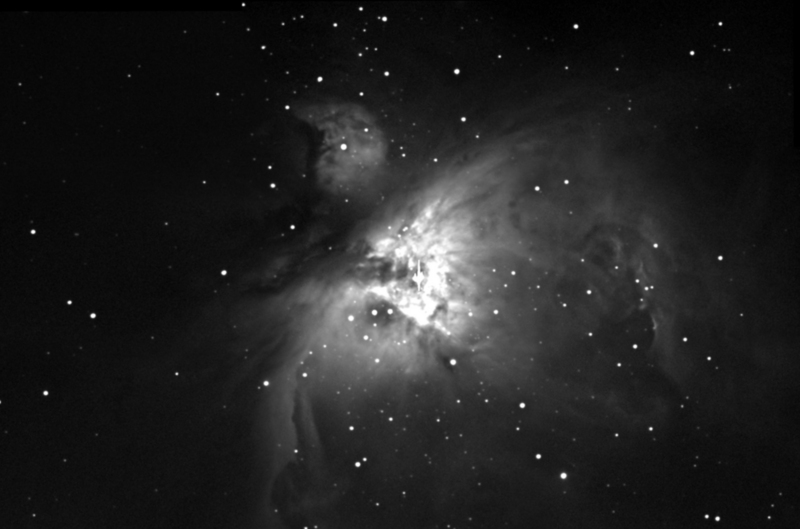 You can’t see these colors with the naked eye using either binoculars or a telescope but here is a picture of the Orion nebula in a land based telescope that is very similar to what you’d see from a modest amateur telescope. Binoculars will not yield the same definition but you will be able to see the gas cloud surrounding these newly born stars. There is a prominent open star cluster that you can see in the winter and it is very close to us at 380 light years. The Pleiades is located in the constellation of Taurus and there are roughly 500 stars that make up this cluster and depending on light pollution and your eyesight, you should be able to view seven of these with the naked eye. If you live in the suburbs or in a rural area, the fuzzy nature of the Pleiades is viewable with the naked eye and even with low powered binoculars you can glimpse the immense star concentration. The Pleiades is a little more difficult to find if you are not familiar with the night sky but in the winter you can see it in the West after sunset. Look in the North East for the backwards 3 that is the Cassiopeia constellation then move left to the constellation of Perseus and the Pleiades is located just to the left of Perseus. 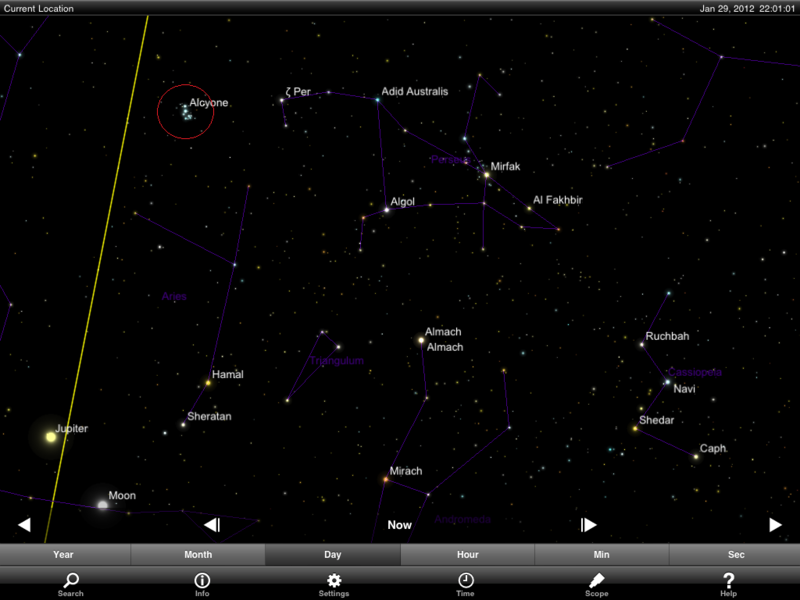 The Pleiades is shown in the red circle on the following picture. 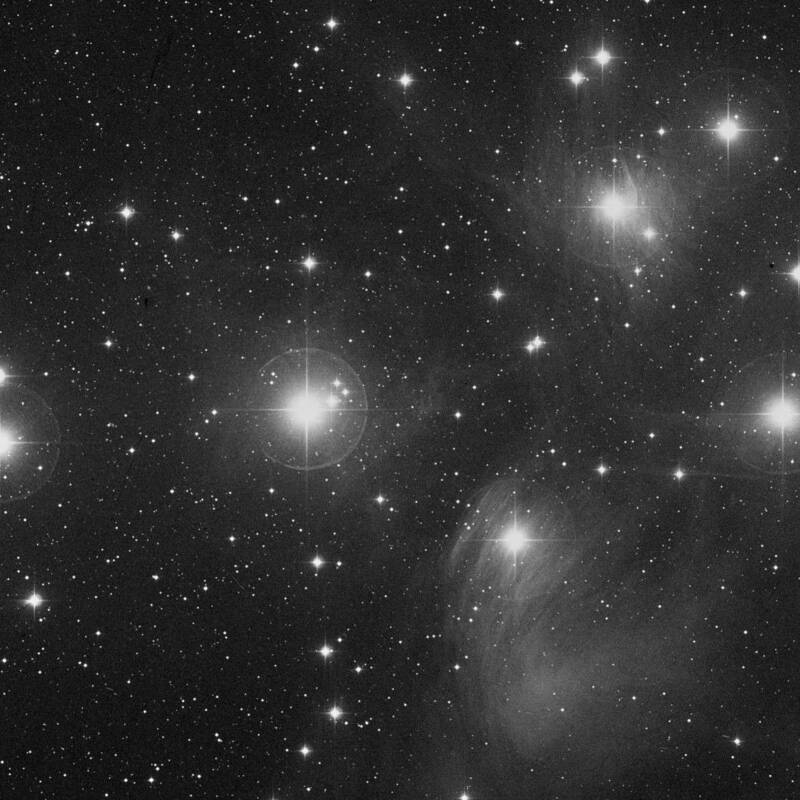 The following picture shows the Pleiades star cluster as seen from a low powered telescope and you can see similar images using binoculars. Go outside during the coming weeks and view these objects with either your naked eye or with binoculars to grasp the beauty of our cosmos and share them with your family and friends. Our Cosmos is truly spectacular and venturing outside on a cold evening to witness these objects provides an opportunity to connect with the wonders of the Universe that can’t be replicated by any TV show you might be watching. There are plenty of amazing pictures of the cosmos on the internet but nothing compares to seeing these actual photons being absorbed on your own eyes.